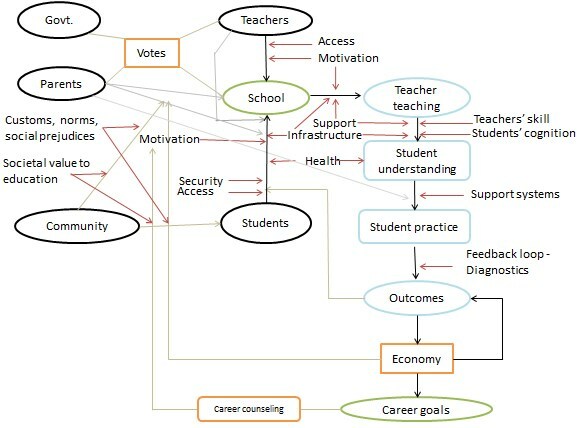 This chart captures the dynamics of stakeholders and processes involved in school education. First, some words about the conventions in the chart. The black arrows show the direction of flow. ‘Teacher teaching’ leads to ‘Student understanding’ and the red arrows are the necessary conditions or constraints. Each red arrow is like a bridge between two nodes. They are ideally orange boxes but due to lack of space, the orange boxes are condensed into red arrows. When there are multiple red arrows/orange boxes, they are connected in series. How to read this chart? One can start from the bottom, from the node of ‘career goals’. Everyone has a career goal. This needn’t the typical goal of becoming a doctor or an engineer. It can be anything, to build a house, to get over poverty and so on. If one wants to achieve those goals through education (outcomes), then ‘economy’ is a constraint. Even if one completes education or has knowledge, economy should be good to able to translate the education into productive activity and similarly the chain moves up. One can also start from the left at the node of ‘Students’. Students have to go to school. There are many constraints between the nodes of ‘Students’ and ‘School’, shown in the chart. Infrastructure, access and security are some. Motivation of student is another factor, which is further influenced by career goals. Career counseling is a constraint in between career goals and motivation. If one can give better guidance to children about future prospects and returns to education, it might motivate them. Parents also matter in the decision of sending children to school. Further, parents’ decision is dependent on economy, as shown in the chart. Better the economy or better their income, then more probability of sending children to school. Societal value to education, prejudices in community also influence parents’ and students choice which are shown by brown arrows. Finally, there is government, who is connected to parents and teachers through votes. In summary, this gives a broader picture of the school education system. What can we learn from this chart? One, this chart is a useful way to illustrate the complexities of the education eco system. It’s like a circuit where everything is connected in series. If something goes wrong even at one place, the whole circuit breaks down. Two, it gives context to the evaluations in education. The chart can also be imagined to be a fluid flow. One can imagine the fluid flowing through black arrows, in the direction as shown. The red arrows/orange nodes are all constrictions in the path of the fluid. The extent of constriction varies across the path and also across contexts. In a particular context, some constrictions are small, so easing them won’t result in significant increase in flow at the ‘outcomes’ node. At the same time, there can be large enough constrictions, easing which can lead to significant increase in the flow at ‘outcome’ node. Evaluations help to find out these major constrictions for a particular context. One can actually use concepts of Bayesian maps, assign initial probabilities (values to the extent of constriction) to each of these arrows, revise them with data and construct a matrix showing the change in the flow at the 'outcome' node for a particular change in each of these constrictions. Three, this chart also helps us understand the approach taken towards reform in education till now. Initially one observed that the path is clogged heavily at ‘infrastructure’. We assume that if this is cleared, then we can expect a significant outflow at the ‘outcomes’ node. After clearing the clog at infrastructure node, no flow was observed at outcome node. Then we realized that investing on infrastructure alone isn’t leading to outcomes. Probably, there are other constrictions which are obstructing the advancement of fluid that has passed through the ‘infrastructure’ node. Then we searched for another clog and tried to clear it and continued this process attempting to do clear constrictions one by one. If we approach these constraints one by one, it is rare to find a dramatic increase in outcomes because one large enough constriction is enough to hold back everything. The lesson here being, the problem has to be addressed comprehensively, clearing clog at all nodes, to ensure the free flow of liquid. Four, understanding the nature of issues. Whenever someone sees this chart for first time designed for a particular context, some individual issues are apparent to naked eye - infrastructure, security, access, support to teachers and so on. These are the first layer of issues. On probing deeper, one understands that some of these individual issues are linked to each other and hence have to be grouped and be worked up on. These are the issues in the second layer. The third invisible layer is the glue which sticks all these individual entities together. What makes the support systems to teachers work? What makes teachers to attend school? What makes them teach properly in the school? What is responsible for the strengthening or weakening of a particular constriction? It’s the glue which binds all these together and this glue is called ‘state capacity’ or ‘governance capacity’. It’s like the soul which gives life to the collection of individual entities of body – heart, lungs, kidneys and other organs. These can also be visualized as nuts and bolts of the system, which may not be visible to naked eye but are responsible for holding everything together. The fourth theme in the ‘Ensuring a Learning India’ series is about this ‘soul’, these nuts and bolts of the system – governance. The upcoming posts on this theme will discuss the relation between governance and education, if lack of governance capacity is a problem in India, the definition of governance capacity, how the lack or excess of it is manifested in various forms, related issues and some lessons from all these.